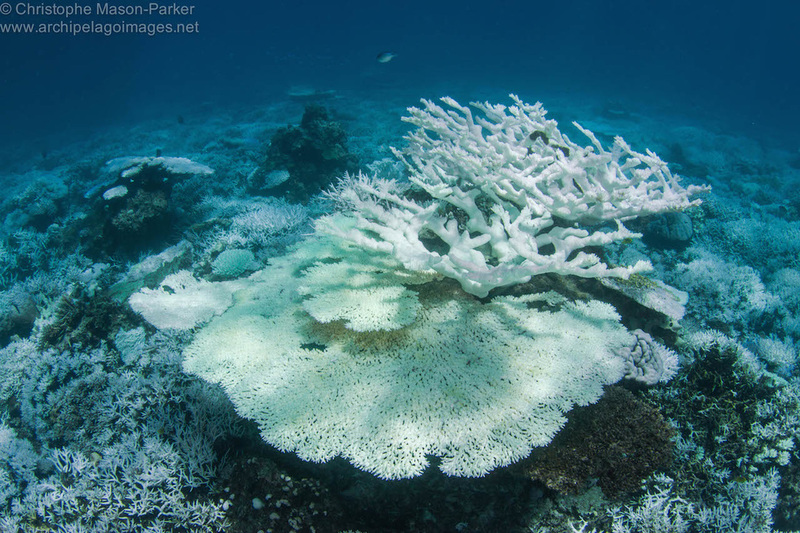 As we approach the end of April, the global bleaching event that has been devastating coral reefs along the Great Barrier Reef and western Pacific, is now starting to take hold in Seychelles. 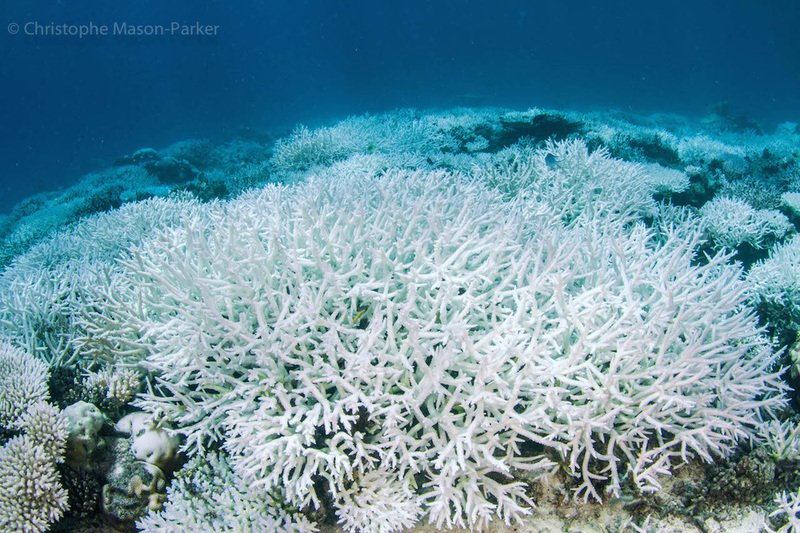 Elevated sea temperatures have seen corals expel their zooxanthellae, first becoming pale and eventually a ghostly white as they struggle to cope with the conditions. The Acroporidae and Pocilloporidae have been hit hardest, and while these species predictably bleached first, all genera now appear to be affected. In the shallows mortality is already occurring and is likely to rise further. 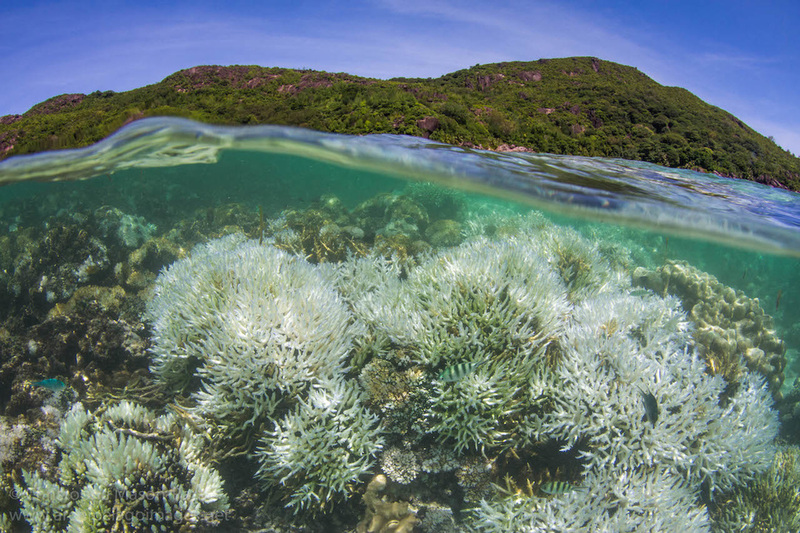 ​The next two weeks are critical and if sea temperatures remain high could lead to a bleaching event comparable with that of 1998, when up to 90% of corals were lost from Seychelles reefs. Alternatively with the Southeast monsoon beginning to blow and the potential for cooler waters just around the corner, it could be that the reefs are saved just in time. Either way, this is the worst bleaching event to affect the Seychelles archipelago in nearly twenty years. Over the next few weeks we will find out exactly how bad it really is. These shallow water Acroporas are already dead with algal growth noticeable upon the colonies surfaces (centre of picture). This impressive colony of Acropora is approximately 3m across and provides shelter to numerous fish species. One month ago it was a healthy, rich brown colour. As sea temperatures reached 31 degrees C and remained at this level, the colony began to lose it's colour and is now completely white. The coral is still alive for now but it is unlikely to hold out for much longer. A bleached colony of Porites sits amongst a snow-white field of Acropora. 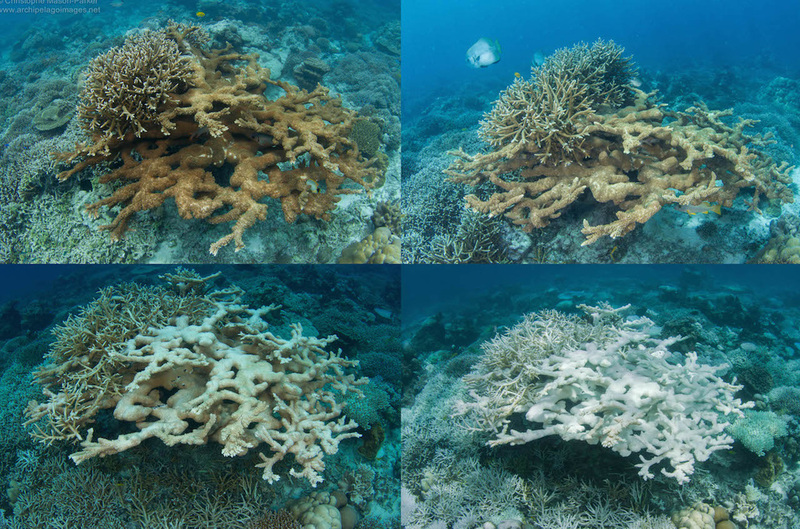 Over 80% of corals at a depth of 5m are currently showing signs of bleaching. A bleached tabular Acroporid takes on a purple hue, contrasting with a backdrop of white branching Acopora. 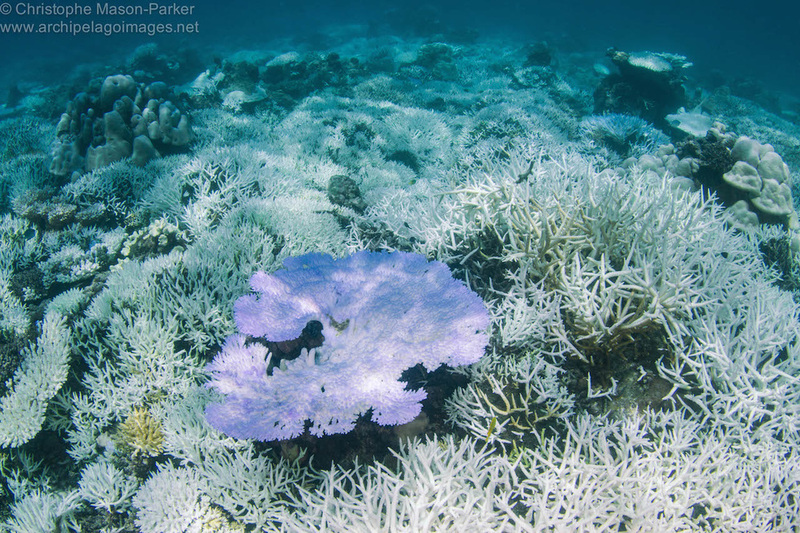 Bleached corals often exhibit soft pink and purple hues, and despite the attractive appearance of the colony the coral is under significant stress. 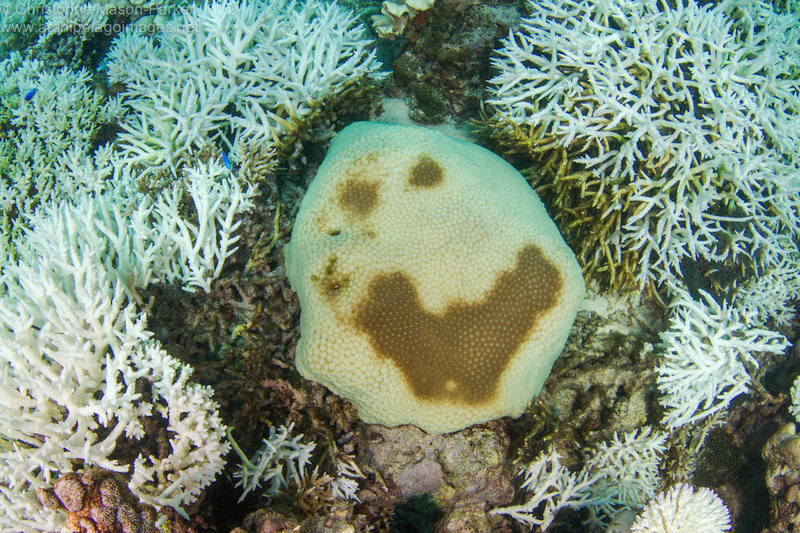 A colony of Diploastrea heliopora displaying an uneven bleaching pattern, with the darker, healthy tissue appearing to form a smiley face upon the coral's surface. A mixture of Acroporidae species all of which are bleached. 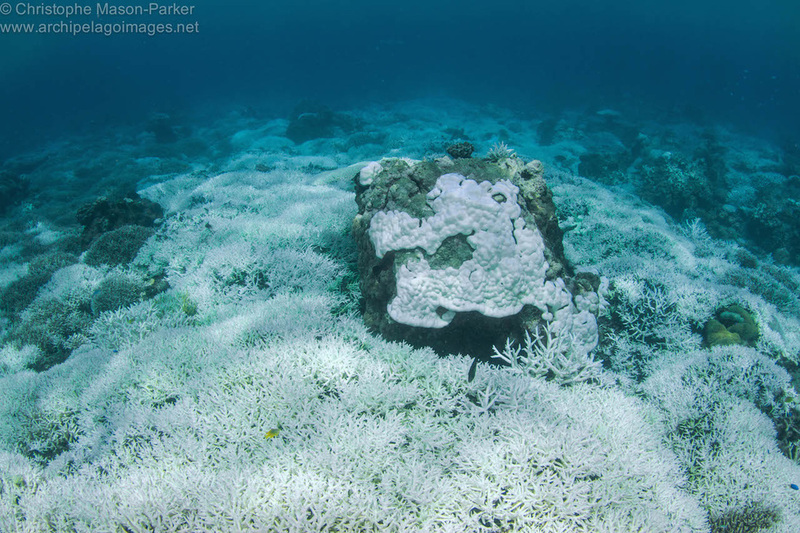 The bleaching event is not confined to the Baie Ternay Marine National Park and is currently affecting reefs throughout the inner islands and beyond. While little can be done to halt the bleaching, NGOs such as GVI Seychelles are collecting valuable data that will help to provide an insight into the extent of the damage.